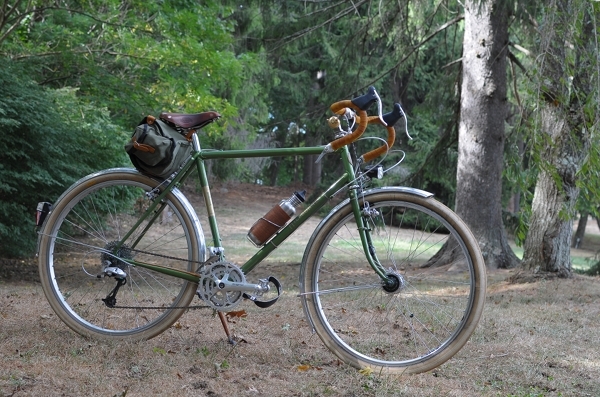 I have owned my Rivendell Sam Hillborne ("Graham Greene") for 6 months now, and have ridden it for 1,800 miles. It is time for a review. The short version is: "I love it. I love it so much!" For the long version, read on. I received a Rivendell Sam Hillborne frame as a holiday gift in December 2009, purchased from Harris Cyclery in West Newton, MA. We were not yet comfortable building up a bike on our own, so the build was done at Harris as well. It took me a few months to save up for the components, and the bicycle was ready in the end of April. Note that Harris Cyclery was not a sponsor at the time, and that everything in relation to this bicycle was a standard purchase. 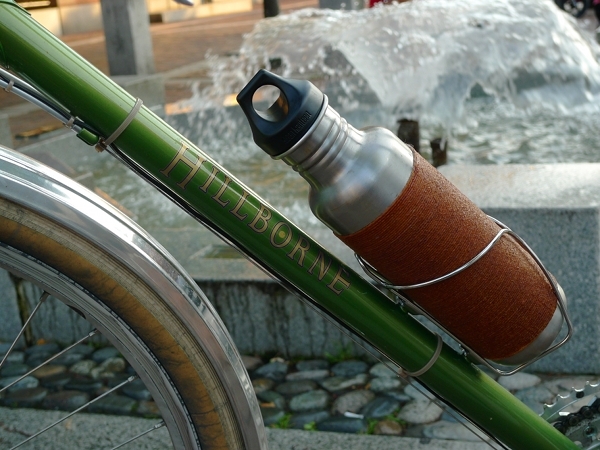 My choice of build for the Hillborne was informed by test-riding a floor model in my size. Since I had no real experience riding a roadbike at that point, I mostly went with recommended specs. These included a 3x8 drivetrain, Sugino cranks, Nitto Noodle handlebars with Silver bar-end shifters, and a Brooks B17S saddle. My 52cm frame was built for 650B wheels and cantilever brakes. 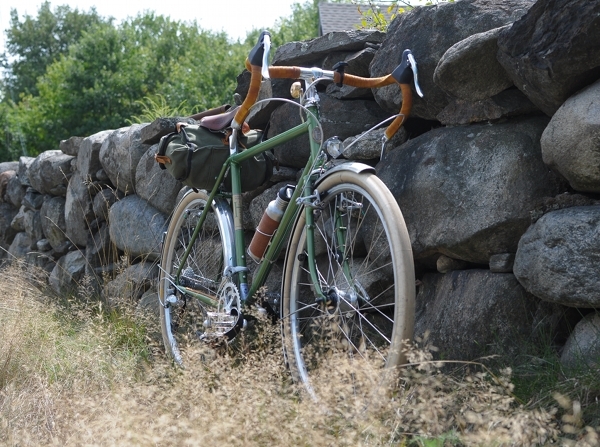 The three things I specifically chose for this bicycle were handbuilt wheels with dynamo lighting (see details here), Grand Bois Hetre tires (see review here), and Tektro short reach brake levers. 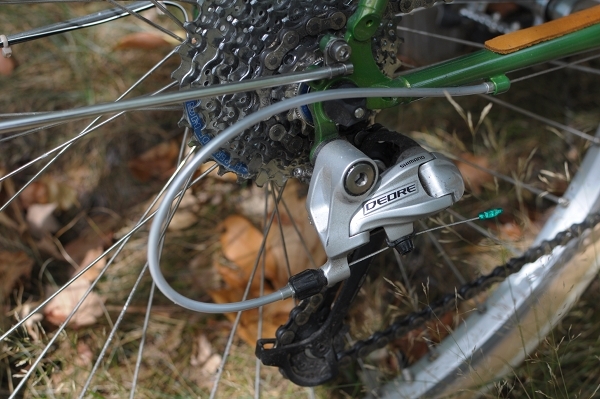 The discovery of these brake levers was crucial for me. One thing that had hitherto prevented me from riding bicycles with drop bars, was my inability to squeeze the brake levers - especially from the hoods. I have small hands and I have damaged nerves in my hands. The combination made squeezing this type of lever impossible. When I described the problem to Elton at Harris Cyclery, we went through different brake levers to see whether any existed that I was able to squeeze. The Tektro levers were it and I am extremely happy with them. Elton also showed me some methods of hand and finger placement that work well for me and do not send electric currents through my fingers. I cannot stress enough what a break-through this was in terms of understanding why I was having problems riding with drop bars before. and my beloved Power Grips (see here for my initial review of them). 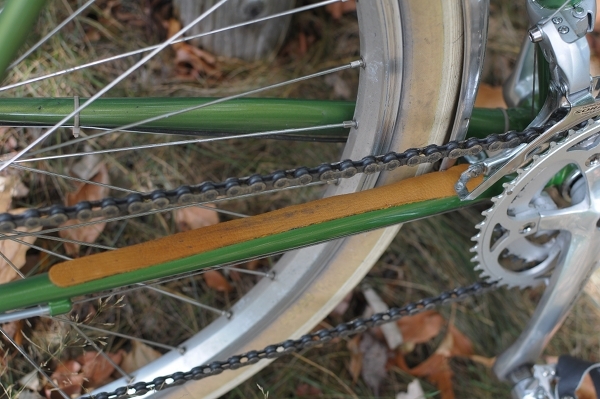 and added a leather Velo Orange chainstay protector. 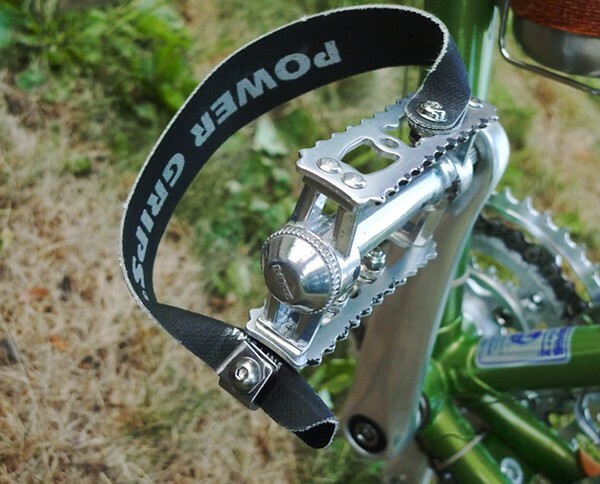 This product is great for preventing the paint on the right chainstay from getting nicked by the chain slapping against it when the bicycle goes over bumps - which began to happen to my Rivendell within the first few rides I went on. and the "taupe" zipties (see top right, under the waterbottle) for routing the dynamo lighting that I find to be less noticeable than black ones. Over the time I have owned him, I feel that Graham has attained an appearance that is distinctly personalised. Looking at him reminds me of the many "firsts" I experienced on this bicycle: from learning to ride with drop bars to going downhill at 30 miles per hour, while cornering, with a full handlebar bag. These experiences certainly did not happen all at once. 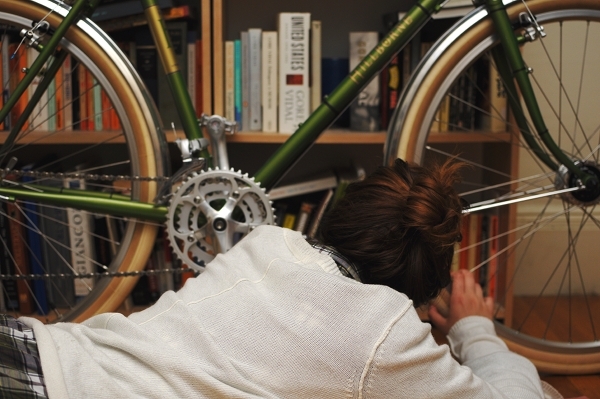 After I first brought the complete bicycle home, I had a minor hysterical breakdown when the reality of owning it hit me. What on Earth would I do with such an expensive bike with drop bars? What if I wasn't able to ride it? The bike would end up standing in my livingroom as a beautiful, ridiculous testament to the gap between my imagination and my abilities. 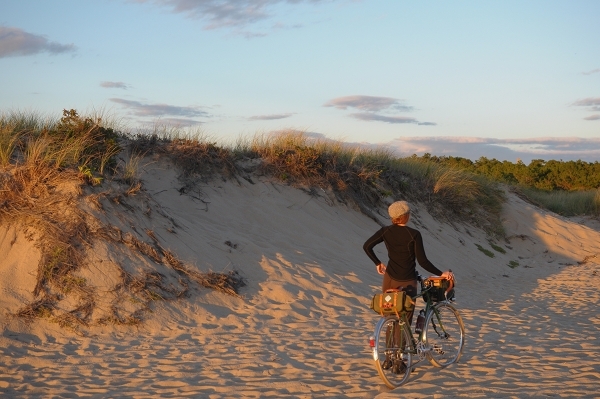 This emotional self-flogging lasted for a couple of days, but then I began to ride the bike. I took it slow and started by setting the handlebars quite high, so that I could get used to the drop bars. The Hillborne has what I would say is a long top tube, and I have a short torso - so the degree of lean this placed me in required some adjustment on my part. Over the course of the first month I owned the bike, I rode it almost daily and lowered the handlebars weekly - until eventually I was comfortable with them being at the level of the saddle. I would recommend this method to those who find dropbars intimidating. I love pretty much everything about this bicycle and find it difficult to muster up any words of criticism. It may be worth noting that some dislike the slight upward slope to the top tube on the Hillborne, but I have no problem with it. If I have to find something bad to say, then maybe it's that the paint seems to be a bit delicate - but then I am used to powdercoat, and it's just a fact that liquid paint is easier to nick. I am equally happy with my choice of components - perhaps with the exception of the Shimano Deore rear derailleur, which I have managed to bang up pretty badly in the course of ownership. Next spring, I may replace it with the Shimano XT "Shadow," which seems more immune to abuse. Otherwise, everything is perfect. I don't know how to describe the ride quality of the Sam Hillborne in technical terms, but in non-technical terms I feel as if I could live on it. Nothing hurts, ever. The bicycle is miraculously cushy over bumps. There is no "toe overlap" with the front tire when turning. The seat tube angle is just right: relaxed enough to be comfortable without having to shove the saddle back on the rails, but not so relaxed as to stand in the way of "performance." I can keep up with the Co-Habitant just fine on the Hillborne, and he is a fast cyclist. The most challenging ride I have gone on so far has been a very hilly metric century (64 miles), and I felt great afterwards. No weight on my hands, no strain on my neck, no knee pain, just comfy cycling goodness. The bicycle seems equally stable at both high and low speeds. I can go over 20 miles per hour while feeling as if I am going 10 and I can plummet downhill while enjoying the view instead of panicking. It is also fantastic on climbs and seems to carry momentum well. As I have mentioned at the start, I have now cycled 1,800 miles on this bike - which may be more than I have cycled on all my other bicycles combined. I had never imagined that I would be doing this much cycling, let alone on a roadbike. I know that it is all supposed to be about the cyclist and not about the bicycle, but I honestly do not think I would have come this far in my road cycling skills on a different bike, no way. I would even credit the Sam Hillborne with how well I took the track bike I rode in Vienna and to the Italian racing bike I subsequently built up as a fixed gear. Once I learned the skills on the Rivendell, I felt comfortable on other types of roadbikes as well - but I would not have been able to learn on them. While the Sam Hillborne was great for me as a beginner, I also feel as if I am slowly growing into it and am only starting to appreciate its full potential. Next summer I am looking forward to doing some more extensive touring and attempting more challenging hills. After all - the bike was born for them. That is what you want in a bike - something you grow into. Glad you have had such a positive and (cycling) world expanding experience with the Hillborn. What's next? A carbon fiber racer??? Stubecontinued - CF is just not my cup of tea. But I do plan to test-ride a Seven soon. If I were to get a racing bike in future, I would be the most tempted by Peter Mooney. I was amazed to pick up one of his lugged steel bikes and discover that it was lighter than my hat! The short version is: "I love it! I love it so much!" the first time i took my road bicycle out it felt crazy to me and i was scared to death of it. for years i purposefully avoided road bicycles because of my back and my non-desire to own a 'racing' bicycle in general. the question i have to myself now is why did i wait so long?!! a bicycle that fits, is pain-free, and takes us on long comfortable journey's is a friend indeed. when i bought my bicycle i actually thought it was a bit ugly and sportier than i wanted, but i quickly left my caring about these things behind. for me, my road bicycle has been my happiness. I realised that I didn't include a single critical word in the review, so I've now added a small paragraph feebly attempting to criticise : ) But this is probably my most biased review, because my personal love of the bike probably makes me blind to some of the problems others might see in it... though I can't imagine what those could be! 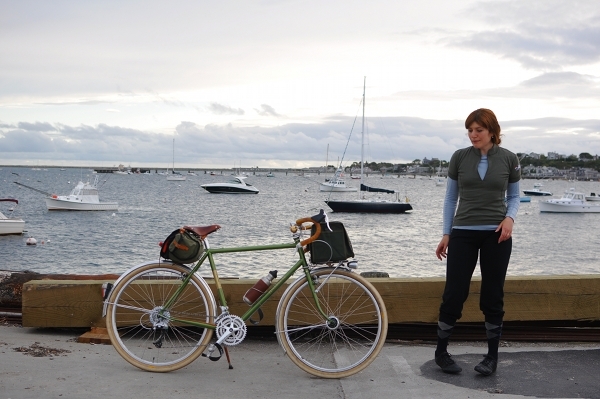 Sigrid - What model and year is your Trek? I've been wanting to try a modern, production roadbike just to see what it is like, but all the ones I see in bike stores scare me. Dottie - Oh, I look forward to reading what you think of the VO stabiliser! Oh, leather chain stay protector! That would be much nicer than my tacky bit of clear plastic. That's the trouble when I read your blog I end coveting so many things, even strips of leather :). I'm so glad you hung in there with the drops and what a sensible way to go about it. Saddle and bars level is my preferred set-up for everyday. Do you find, now that you are so familiar with them, that drops help your hands more than flat bars because of the variety of positions possible? BB - not just any strips of leather; strips of leather with a sticky underside available in colours to match Brooks saddles! Re different handlebars: I cannot ride with flat bars at all actually anymore. That position with my fists placed in front of my body is death to my hands immediately (the electric current feeling kicks in within minutes). For the same reason, I can't hold the tops of the drop bars, ever. So the positions I do have are hoods, shoulders, ramps and drops. That's 4 good positions to switch between. North Road type bars give me 1 hand position, and Porteur bars give me 2 - which for me is not enough for long trips (long = over 30 miles). 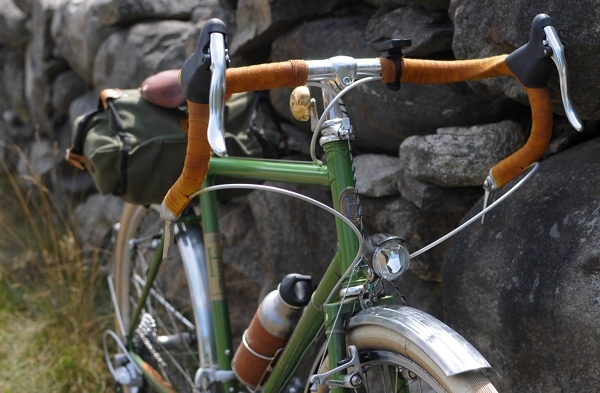 Your Rivendell is such a gorgeous bicycle! I've ridden older Schwinn and Raleigh roadbikes, but the positioning has always been too aggressive, and I've always been left with a sort of defeated feeling about the whole roadbike experience. The Rivendell sounds lovely, however - a perfect combination between a "fast" bike and an all-around-useful commuter and touring bike. 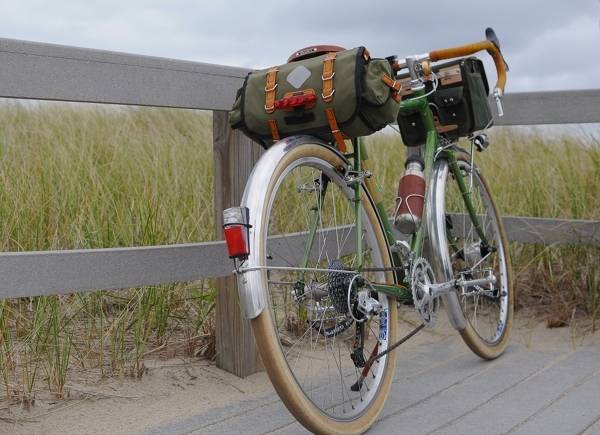 Now, if I wasn't saving for a Brompton (a more practical selection for my travelling lifestyle currently), I would definitely consider the Rivendell, but I lean a bit more towards the Betty Foy with road bars (diamond frames scare me). Congrats on a beautiful bike and a great review. Just beautiful. Wish I had one similiar. "I've ridden older... roadbikes, but the positioning has always been too aggressive, and I've always been left with a sort of defeated feeling about the whole roadbike experience." Yes, that is exactly the experience I had last year when trying vintage roadbikes. I have now learned a few tricks to make the positioning these types of bikes more comfortable, but it requires replacing components. Getting a seatpost with setback and shoving the saddle back to slacken the seat tube angle 2 degrees or so usually works to take pressure off the hands. Wider handlebars with modern brake levers do wonders for comfort as well. 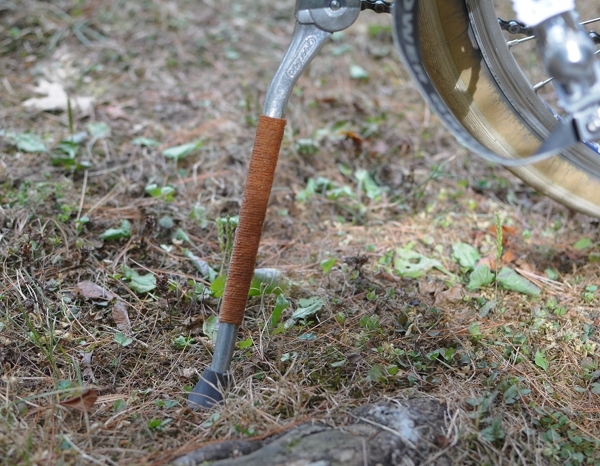 And a shorter stem (try 6cm extension) will bring the handlebars closer to the body, for a shorter reach. But... unless you can find all these parts second-hand or already have them left over from other projects, things can get expensive! You have grown with your bike. It has grown with you. And so has our experience and appreciation of cycling. Thank you, Velouria! Thanks for this. Diamond frame? - what are your reasons for preferring? Your discussion of drop bars is making me reconsider my lifelong rejection of them. as for price, I guess what I'm wanting to pinpoint are what ARE the different sets of compromises? I'm not needing to buy a road bike tomorrow so a difference in price is really just a shorter or longer period of waiting while saving up. 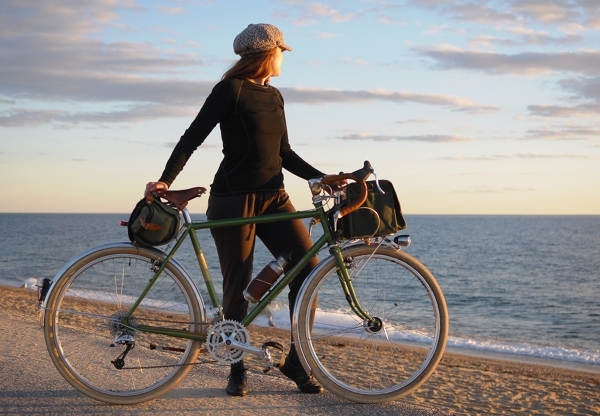 Emma - If you can at all plan ahead and afford a $2,000+ bicycle (exact price depends on components), I would recommend the Rivendell Sam Hillborne over anything else on the market, because of its uniquely comfortable geometry. All too often, a roadbike is a compromise between comfort and speed, but having ridden multiple roadbikes now, I honestly feel that the Rivendell gives you both, without compromises. The beautiful lugwork is nice too, but the fantastic ride quality makes the looks seem almost insignificant. Why do I prefer a diamond frame for touring, that's a tough one to put into words. I feel that I can balance and maneuver a bike better in a leaned over posture with that bar between my legs. It is an entirely subjective, sensation-driven feeling and I have no idea whether it's my imagination or whether there is something to it in terms of physics. Also, the bicycle is more stable when I am stopped and off my saddle, but still standing over it. Because of the top tube, I can lean it against one of my thighs while I stand over it and drink water, look at my map, or retrieve things from my bag. 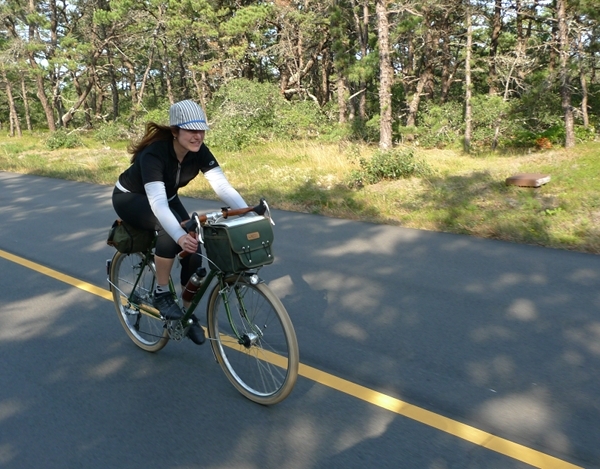 A mixte is more likely to slide or fall over. I should add that I do not ride in skirts while on a roadbike, so the diamond frame does not present an issue in that sense. Thanks for that thorough answer. I've always ridden with a diamond frame until the Oma - what you say makes sense. I'll have to consider it. About once every other week I get the urge to ride a lighter bike but go back to the Sam. It is so smooth, stable, predicable and handles well with a load. I cannot really imagine a better bike for general riding or commuting. My only real complaint is the 650B wheels. I would rather that they either be a MTB 26 inch or a 700c and in a 52 they could have been either. Fai Mao - Shanghai to Hong Kong... wow! What about moving the saddle forward? A mere 2cm forward will bring the seat tube angle to that of an aggressive roadbike. I love the combination of 650B wheels and the Grand Bois Hetre 42mm tires. It is just a perfect combination in terms of speed and stability. I would not want 26" wheels on this bike as I prefer a larger size. 700C would have been fine, but then I couldn't have my Grand Bpis Hetres! I should also note that sizes larger than 52cm are built for 700C wheels. Ah, my Sam Hillborne... I would NEVER had thought a bike would make such a difference. I too traveled to Harris Cyclery (90 + miles from home) and worked with Elton (and Susan) on the purchase and build of my Sam H. and my wife's Betty Foy. Can't say enough about the experience and the bikes. Exceptional. I looked hard and long before spending this type of money for a bike and have not regretted it for a second. Compared it with a Surely LHT as I had narrowed it down to the two. Both are great rides, but you have described the Sam to "T". Another chainstay protection method I've grown fond of over the past few years is reflective adhesive vinyl. I used to do emergency vehicle graphics, and saved any usable scraps for my bikes. The Scotchlite 280 I've used and its equivalents are thick and durable for the chainstay and any cable housing rub spots like the headtube. It's available in several different colors and add to nighttime visibility. When I was bike shopping last summer, I test rode (at Harris) a Sam Hillborne, and I must say, it was a nice ride--smooth, comfortable, handled very well. Very pretty. But in the end the pile of money I had to spend on a bike wasn't quite big enough. Also, no disc brake option. FWIW, The bike I ended up with came with a Shimano Deore XT rear derailler, and it's been fine---seems a good choice for a touring-type bike. Velouria, if you want to try out a mass production road bike, I suggest you ride a Trek Pilot 2.1. I am small and have the women's specific version. It is so super comfy and rides like a dream. The WSD actually came in a very attractive slate gray. The saddle had to be replaced with a Brooks. I rewrapped and shellacked the bars, of course, and covered up the ugly Bontrager bits with twine. I actually get a lot of compliments on the bike. I don't think people can tell it's just a Trek. 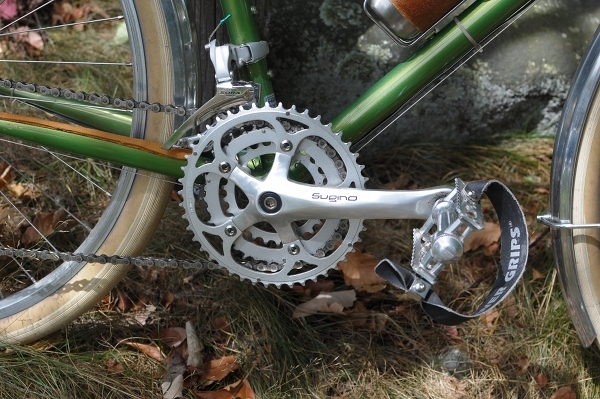 I love the Shimano 105 drive train and the geometry is great. It is super light, glides up hills and is fun to ride. Someday, I hope to own a higher end lugged steel road bike, perhaps a Riv, but for now, I love my ride. In a word..Lovely.. between your review and Alan's at Ecovelo I have some serious Sam envy going on here! Glad you enjoying Road biking it can be alot of fun especially if you are not a slave to the bike computer ;-) Chapeau on Mr Greene. Thanks for a specific review finally, although it is more of a love letter. I wish I could have gotten a rivendell. I would like to know how stable the bike is loaded? Is it flexy, does it wobble at high speeds? I have a surly lht and I've been fighting with it for a year. Can't get rivendell's in Vancouver except one shop has a few large berliot frames and will never bring in more. Anyway, my TOURING bike wobbles and flexes when even slightly loaded and is scary down hills. I will try your method of starting with drop bars on my old new trek whenever i get it going. I have always been scared of drop bars, but had a road bike as a city beater and got used to the drop bars quickly. But, after my major car accident I found I couldn't reach anymore, even mountain bike flat bars were too much. I've got back problems, shoulder problems, nerve damage in hands etc.. Grant Peterson is into higher drop bars anyway, so he designs his bikes that way. "Getting a seatpost with setback and shoving the saddle back to slacken the seat tube angle 2 degrees or so usually works to take pressure off the hands." I don't fully understand this but suspect it would be life-changing if I did. I love my Homer Hilsen (with moustache bars) but have never quite worked out the setup well enough to avoid sore wrists and feet that fall asleep on long rides, problems I've never had on any other bike, but then, I've never had a road bike. Does this advice relate to the angle of the seat or just its forward/rear location? Nina - forward/rear. Move the saddle back on the rails 1cm and see what happens. Also, it might be the Moustache bars and the position they place your hands into. I cannot ride with them, my hands go numb very quickly. Thanks so much, Velouria! I've suspected it may be that the moustache bars need to go, but have been in denial since there is a lot I like about them. That may be the key piece of advice though. Much appreciated. Thanks Velouria. Got it! Much appreciated. I have lots to learn. I love that you started with the bars up high and lowered them gradually. It is crazy that you cannot do that on most bikes sold today without involving spacers and other ugly things. I am familiar with the Guidonnets. I can't hold the tops of the dropbars, so those levers won't work (and neither will interruptors or turkey levers or anything else that requires me to hold the tops of the handlebars). Holding my hands on the hoods feels great though, and the Tektro short reach levers are perfect for me. "The beautiful lugwork is nice too, but the fantastic ride quality makes the looks seem almost insignificant." 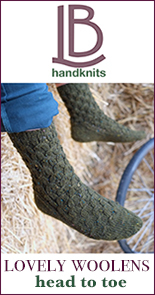 Velouria, In several places on your blog you imply that there are differences between the Betty Foy and the Sam H that make Betty less suitable for the kind of riding you've been doing on Graham. The Rivendell website, however, suggests they are made to do the same job. Can you describe the differences as you see/feel them? Anon - Rivendell *sort of* states that they were meant to do the same job. But upon a closer reading, it's not that cut and dry. There are a few objective differences that make them not the same bike.
. The sizing is different. Someone with my PBH needs a 58cm Betty but a 52cm Sam.
. Riv states that even though it can be fitted with drop bars, Betty was really designed to be ridden with Albatros bars. The last two points are probably the main reason why I believe the Hillborne is more suitable for long distance touring than the Betty Foy. 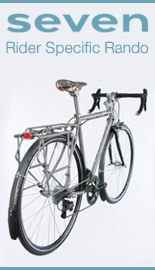 If from the start I plan to fit a bike with drop bars and use it for loaded touring, why would I get a frame that is described as having been designed for upright bars? Wish I had $2000. I may need to spend $200 on a vintage road bike to see if I like it. For now, I have no time for rides over 10 or 20 miles, so my Breezer is fine for everything. But I do love the look of your bike. Joseph E - One reason I wanted this bike is that I had tried vintage road bikes and was miserable, even after spending money updating components. Now I actually know a few tricks that would have made me less miserable. But no one told me them at the time. 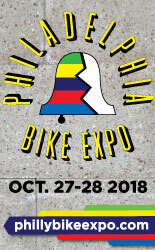 BTW, I just realised that you are from Bikes for the Rest of Us- Love your website! Velouria, Thanks for your comments on Betty vs. Sam. They do make sense. 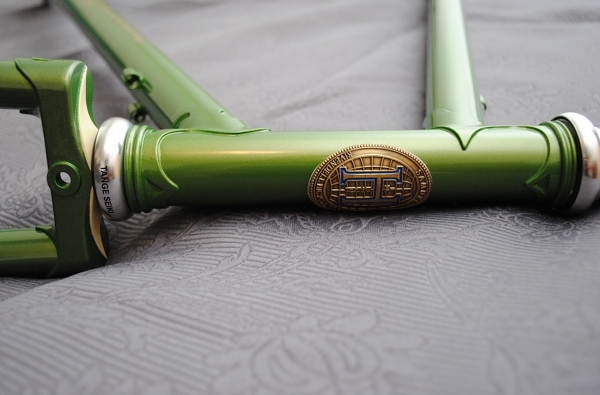 There are two builds on the Renaissance Bicycles website of Betty Foys with drop bars (and not with the dirt drop stem, which I don't care for). It would be interesting to hear how the owners are using those bikes, and how Betty rides with drops. I do wonder about the betty foy which I fantasize about often. I love the green of your Sam and know I would have to hunt one down or pay them to paint a sam or bf that colour. I also would say yes to a saluki. I have albatross bars on my surly and I HATE them. I do not know why the betty foy was designed with them in mind if the bike is meant to do all that sam can do. They are very wide, force you to have your arms splayed out too far and if you are a smaller person it just doesn't work. I do not doubt the betty foy is a dream to ride, but... If I had one I would put a narrow french style upright bar on the bike. I prefer 'lady' frames because I am a clutz sometimes and am also short so can I ride a bike that FITS better than a super small diamond frame. It's disheartening when your serious bike looks like a child's bike because the top tube has to be so low! 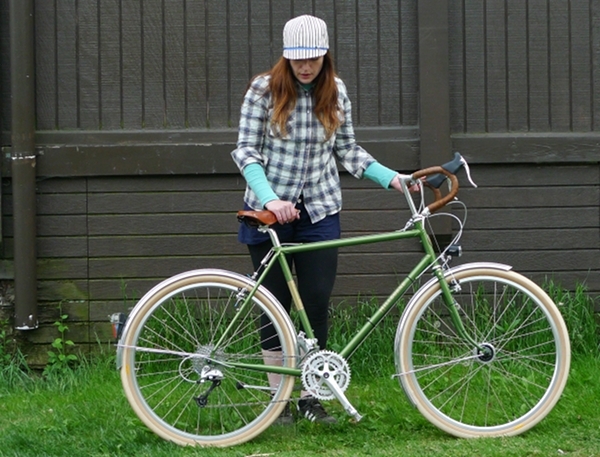 Mixte frames are meant to be road bikes as strong as diamond framed road bikes. My old super lugged mixte needs a serious component overhaul, but it has such a wonderful fit and ride quality I know I could do some serious riding. So geometry is the issue more than if the bike is diamond frame or not. Good to know you've had no wobbling and flexing issues. I have read that lugged steel frames are much much stronger than tig welded (which is what most major bike companies are doing with their steel bikes). You'll have to try load up some panniers and see what happens. I do carry quite a bit of weight, but it's also what the bike is meant to do. I wonder why a bike like the lht meant for touring is having such flexing problems? many people are complaining so it is not just me. I wish I had the courage to sell it. The Sam and Betty are like van diagrams? The Salsa Vaya in steel for going rails to trails - my Schwinn Super Sport DBX in alloy is what they call an adventure bike. 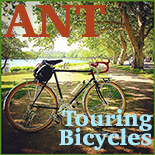 They are disc brake bikes that combine the best of the road and touring bike into a bike that you can really ride anywhere. I find that when I bring home groceries in my panniers its forgiving and stable and holds the road where I suspect that would be difficult to do with a conventional road bike. For apartment life, portaging a bike up and down the stairs can be difficult. I became aware in 2009 of the mini velo in Japan. This is basically more or less a rigid small frame bike built around 20" wheels. I built up a Big Shot Mini Polo bike around 406 wheels and the final build price turned out to be cheaper than the competition Sillgey Piccolo. The double butted cro-moly frame is worth the substandard parts the bike comes with. It is fast and comfortable for such a small bike and if I had the room - I could imagine riding it around my living room! What a great review. It's nice to see you're enjoying the bike and putting it to good use. I have quite the pod of Rivendells myself and they're fantastic bikes that have brought me a lot of enjoyment. Are you considering any longer rides for next year, perhaps a 200k brevet? Great review, and I love the way you demystify road bikes for those who may think they are destined to be ugly, uncomfortable, or intimidating! I say this as someone who mostly rides old fendered, fat-tired drop-bar road bikes with bags like your Sam Hill to get around in Los Angeles. If you're looking to try something else, perhaps something more aggressive and strictly recreational, I suggest a test ride on a modern handmade steel bike with a carbon fork, preferably with good 25mm racing tires like Michelin Pro 3 Races and as unloaded as you can be. I have a Gunnar Roadie set up like this and I love it! Anon 4:07 - I was planning to do a century in September and prepared for it, but got sick at the last moment and my plans were derailed. It was so sad really, because by the time I was well enough to cycle again it was already getting dark early and my work schedule changed - so that doing a century won't be possible anymore until next spring. 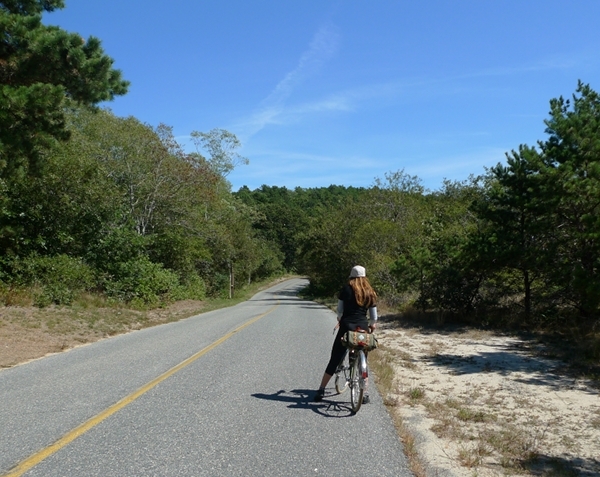 But yes, next year I am hoping to do longer rides, as well as multi-day trips. 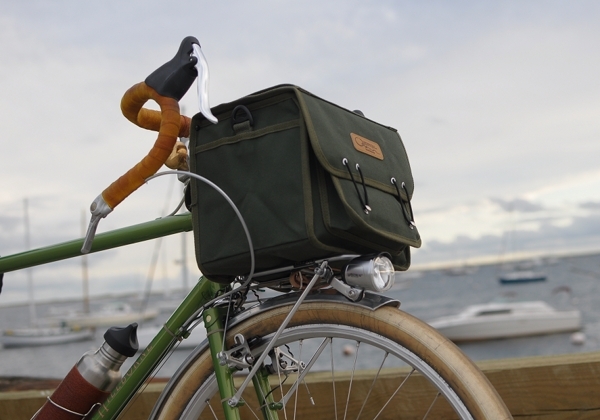 The Hillborne is perfect for that. jhvu - I have a Trek 610 that I picked up over the summer and a Francesco Moser racing bike that we built up as a fixed gear. Both are pretty aggressive, but after enjoying the Trek for a few months I just don't think I need it in addition to the Rivendell. Oh and I had Michelin Pro Race 25mm tires on it, though eventually switched to Pasela. I have a Sam on order (52 as well.) I'm wondering what size fenders you are using for the Grand Hetre tires and if there was any problem making them fit? Thanks for a great review and I'm even more excited about getting my bike than I was before. NR - These are the Velo Orange Zeppelin fenders for 650B. They are a perfect fit for the Grand Bois Hetre tires, no problems. And very durable too. I'll be honest and say one of the new Focus Izalcos (the 4.5kg) one is what you need for the hills! Your bike looks heavy. However would you cope knocking that up the Tourmalet. Short answer: you wouldn't! Wow what an inspiring review! Now I need to look into a Sam Hillborne. I have been looking into a Jamis Endura, the only carbon bike I know of that is built to accept a rack. Light quick touring is what I am after. Velouria--I agree! I'm wrangling a 56cm Sam, and it is definitely an "all-around" just as Rivendell promotes. Steady under a moderate load; tracks true (testimony to good frame alignment); excellent versatility in fine-tuning one's own fit; handles sweeping, downhill turns at speed calmly; many braze-on & bolt-on plus tire options; and comfortable to boot over distance. Diggin' mine, for sure! Rivendell's advice on bicycle fit and comfort is enlightening. I'm so tired of salespeople in bicycle stores telling me I "need" a short, stiff, bike with handlebars 4 inches lower than the seat. I used to enjoy the Bridgestone catalogs, and Rivendell's website sounds like the same philosophy. Grant Petersen the owner of Rivendell was the guy who wrote the Bridgestone USA catalogs.